Maragatería is a county in the province of León, well known in Spain for its beautiful medieval architecture and for its cocido maragato. 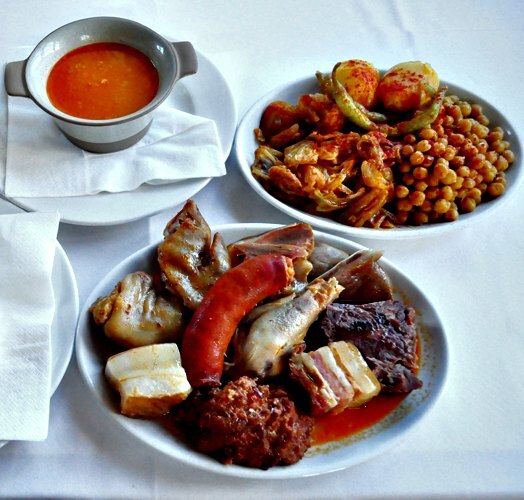 The cocido owes much of its fame to its use of two local products, spicy chorizos and cecina (salted beef), and to the fact that it is the only Spanish cocido that is eaten in reverse order: the meats and sausages are served first, followed by the legumes and vegetables, and finally the soup. Several theories account for this out-of-step dining sequence. One insists that the dish is easier to digest when eaten in this opposite order. Another was born in the mid-nineteenth century during the First Carlist War, when Spain was plagued with civil unrest during the struggle for the throne between the daughter and the brother of Ferdinand VII. Soldiers tired of being called unexpectedly to the battlefield during their meals, with the result that they were able to eat only the soup and never the succulent meats, decided to reverse the order. 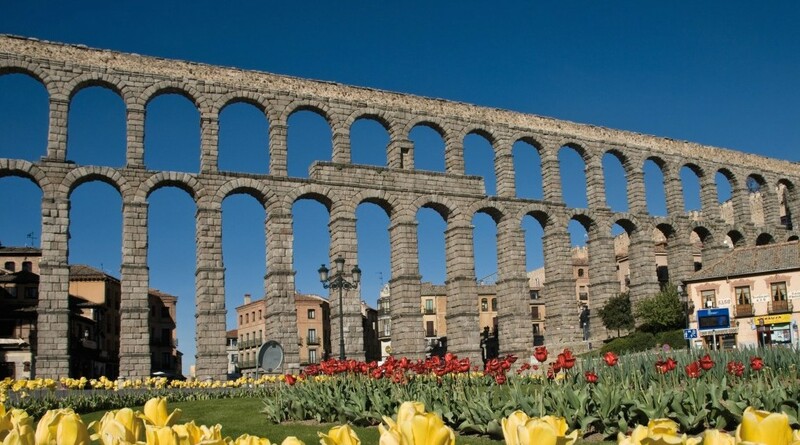 In yet another theory, the arrieros, porters who once crossed Spain, transporting goods on their donkeys, used to wait in Astorga, a town in Maragatería, for the fish to arrive from neighboring Galicia. The moment the fish appeared, the arrieros had to set out again, inevitably having enjoyed only the soup and never the meats. In whichever order it is served, cocido maragato is a robust, satisfying dish. There is no substitute for cecina, the local superior beef cured in salt, but the stew is still flavorful without it. A relleno, a large dumpling made of chicken liver, chorizo, and jamón serrano, is added to the cocido toward the end of cooking. Rinse the chickpeas in a colander under cold running water. Place in a bowl, add water to cover by 3 inches, and let soak for at least 8 hours or up to overnight. If using a cured ham hock, place it in a bowl with warm water to cover and let soak for 8 hours or up to overnight. Drain the ham hock, if soaked. To prepare the meats, in a large stockpot, combine the ham hock, beef, stewing hen, pig ear and trotter if using, and salt pork with water to cover by 3 inches. Bring to a boil over high heat, boil for 10 minutes, and then skim the foam from the surface. Drain the chickpeas and wrap them in a cheesecloth pouch tied with kitchen string (to make it easier to retrieve them later). Add the chickpeas to the stockpot holding the meats. Cover, decrease the heat to medium-low, and simmer gently for about 1 ½ hours. Skim every 30 minutes and add more water if necessary to keep the ingredients covered. Add the chorizos and salt, decrease the heat to low, and continue to cook for 30 minutes longer, or until the sausages are fork-tender. At this point, the chickpeas and the meats should be done. Just before the chickpeas and meats are ready, cook the vegetables. In another stockpot, bring the water to a boil over high heat and then salt it lightly. Add the carrots, potatoes, and cabbage, decrease the heat to medium, and cook for 30 minutes, or until most of the water has cooked away and the potatoes are fork-tender. To make the dumpling, remove the casing from the chorizo and mince the chorizo into pieces the size of lentils. Transfer to a bowl. Add the eggs, jamón serrano, chicken liver, chopped garlic, and bread crumbs. Mash the mixture well with a fork and shape it into a large ball with your hands, pressing it until it is tightly packed. Add to the stockpot holding the meats and cook for 10 minutes, or until cooked through. 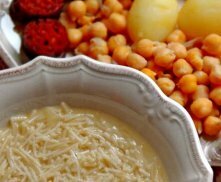 When the meats and chickpeas are ready, retrieve the cheesecloth pouch of chickpeas and set aside; keep warm. Lift out all the meats and the dumpling and set aside; keep warm. Pour the broth through a fine-mesh sieve placed over a clean saucepan. Bring the broth to a boil over high heat and add the pasta. Boil for about 5 minutes, or until tender. Remove from the heat and keep warm. When the vegetables are ready, drain them into a sieve or colander. Place the carrots and potatoes on a warmed platter and keep warm. Squeeze the cabbage thoroughly to eliminate any excess liquid. In a sauté pan, heat the olive oil over medium heat. Add the garlic and sauté for 2 to 3 minutes, or until golden. Sprinkle with the pimentón, mix well, and then add the cabbage and turn several times in the oil and garlic to heat through and blend the flavors. Transfer the cabbage to the platter holding the carrots and potatoes. Cut the meats and sausages into pieces and slice the dumpling into 1-inch-thick slices. Arrange the meats, sausages, and dumpling slices on a large serving platter. Remove the chickpeas from the cheesecloth pouch and add them to the vegetable platter. Serve the meats and sausages as the first course. Serve the chickpeas, cabbage, potatoes, and carrots as the second course. Serve the broth with the pasta as the third course, reheating it if it has cooled.